Services - ABC BURGLAR ALARM SYSTEM INC.
We market, install, and service to the public and private sector throughout the area. We use a redundant UL approved 24-hour central monitoring station to ensure the alarm signals are handled with the utmost speed and accuracy. All personnel are fingerprinted and have a criminal background check performed and are certified from the Department of Criminal Justice. Protect your business against theft, fire or water damage with a burglar alarm system, fire alarm system, video systems (CCTV), card access systems, flood detectors, gas emergency, environmental control & much more! Your home is one of your most important assets! Protect your family from intrusion with an alarm system, CCTV, exterior and/or indoor cameras. Turn your home into a "Smart Home" with help from ABC. Also protection from fire, medical emergency alert, basement flooding, or carbon monoxide gas. Stay informed with our residential CCTV system allowing you to record video of unwanted activity while viewing from your smart device. 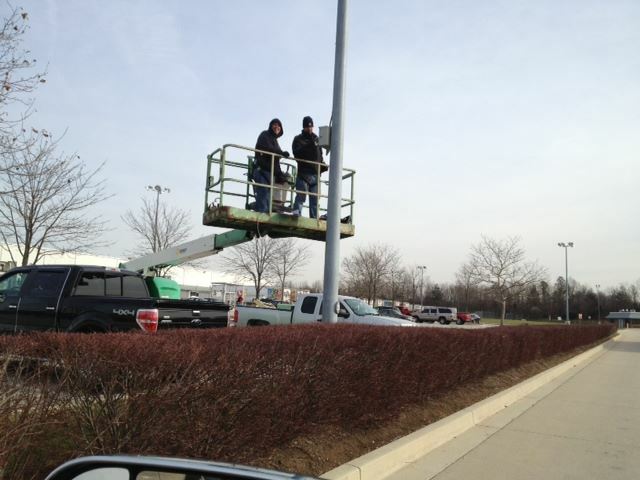 ABC technicians installing cameras at a job site. Access control software/hardware, control panels, visitor management systems, readers, credentials. Designed to work together seamlessly, Access Systems' products provide you with the technology you need to deliver sophisticated security solutions—from the simplest to the most challenging. ​​The quality of loss prevention program is entrusted to management, employee theft, pilferage and embezzlement are all insidious menaces to the survival of business today. We are a family-owned business in Maryland and strive to make our customers feel like family too. It is our goal that you receive top notch customer service and that we are able to provide specialized detection central station monitoring through the utilization of current technologies.